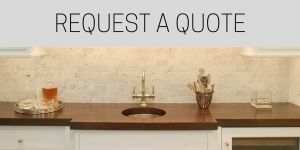 Each wide plank wood countertop made by Brooks Custom is hand-made to your specifications and designs. 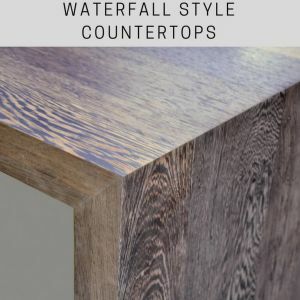 In addition to thickness and color, we offer a number of other design options for your wood countertop details. 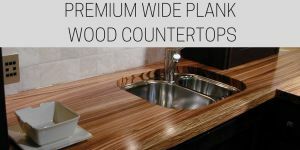 All Premium Wide Plank wood countertops come sealed with our signature Marine Finish. This permanent finish that provides a protective water and stain proof finish, that has a satin sheen. In addition to the satin sheen, the top can be made with a matte or high polish finish. Our skilled craftsmen are capable of creating custom and unique shapes on our wide plank wood countertops. Add curved corners, round tables or tops, or any other unique shape your design calls for. Add integral drain board grooves around the sink area to aid in cleanup. These grooves can be tapered or left rounded. Grooves for stainless steel trivet bars can be added near the cooktop to protect the wood from high heat. 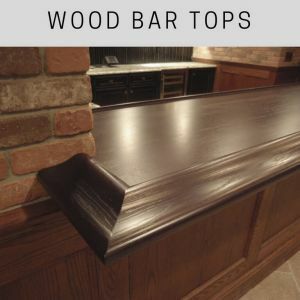 These bars can be removed easily for cleaning. Islands or countertops in small kitchens can add some extra counter space or sitting room. Leaf extensions can be added with hinges or can be built into an expandable table top. 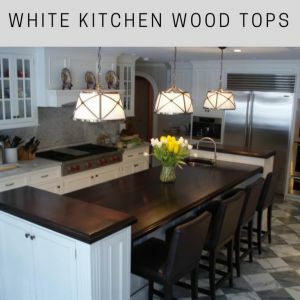 All of our wood countertops and wood table tops are delivered directly from our factory wood shop in Mt. Kisco, NY. Our unique wholesale design process puts you in direct contact with our designers and craftsmen to ensure the accuracy of your final product.